Safety with the little ones is paramount, and one of the easiest and most effective ways to keep a little one safe while driving is via the car seat they use for road travel. This is one area where quality really does matter. Safety 1st realizes that, and puts a lot of thought and consideration into how their products are made. I've been in an accident, just last winter when I hit black ice and spun across a busy highway, landing my SUV on its side. Thankfully, I had just done the school run, so there were no little ones in the car, but it was scary enough to make me realize just how fast something can happen, even when you're doing everything right. I was a huge advocate of proper restraints in the car prior to that day, now I'm a fanatic. Better safe than sorry has never held more true for me than it does now. 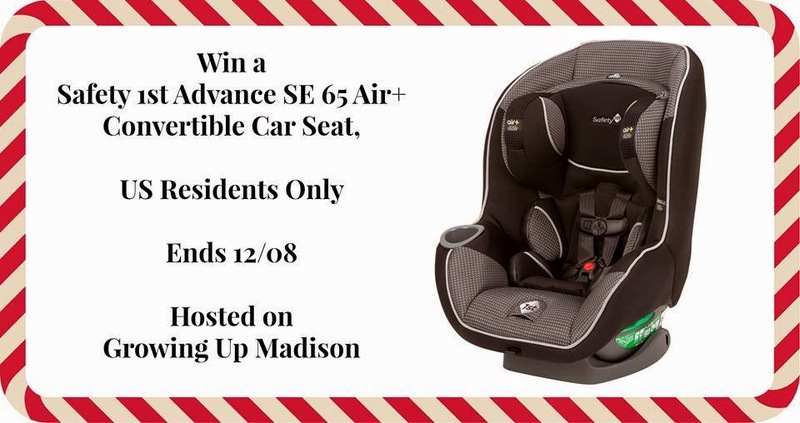 If you have a little one at home, or know someone who could use a car seat for a holiday gift or baby shower present, I encourage you to enter. This is a gorgeous seat, designed to be comfortable and nice to look at, but most importantly to keep baby safe. This Safety First Advance SE 65 Air+ is designed to hold little ones 5-65 lbs. You can learn more about the seat by visiting the Safety 1st website. For great tips on how to survive holiday travel, be sure to visit Growing Up Madison's post here, and a big thank you to Amanda, the owner of that site, for working together with Safety 1st to host this giveaway. This is a super nice car seat! Wish I would have had it when mine were little! My parents are coming over for dinner. I will be cooking and entertaining my family for the holidays! We will be staying home for Thanksgiving and going to my moms house for Christmas. We are heading to Great Wolf Lodge for the holidays to enjoy some water park fun. We are going to travel to grandma and grandpa's house. Paula C.
Visiting lots of family, and getting ready for our trip. I will be staying home spending quality time with my family. We're going to a friend's house. We will be going to my grandmother's house. We are going to my Son's house for Christmas dinner. Most likely we will be staying home, just my husband and I. We're travelling to my sister's. We will be hosting our family and friends for Christmas this year.